This vehicle is equipped with a speedometer and odometer. 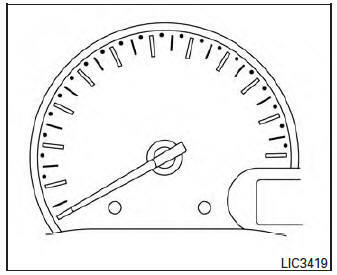 The speedometer is located in the center of the meter cluster. The odometer is located within the trip computer. 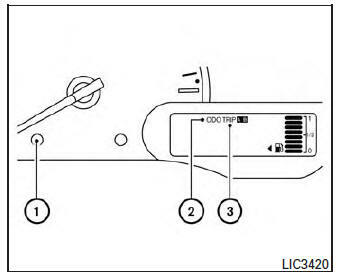 The odometer/twin trip odometer is displayed when the ignition switch is placed in the ON position. The odometer 2 records the total distance the vehicle has been driven. The twin trip odometer 3 records the distance of individual trips. Press the change button 1 to change the display as follows: Odo→Trip A→Trip B→Ins fuel consumption→ Average fuel consumption → Cruising range or (DTE) → Odo For trip computer information, refer to “Trip computer” in this section. Press the change/reset button 1 for more than 1 second to reset the currently displayed trip odometer to zero.